Hacking cough. Sneezing. Runny nose. Congestion. When cold or flu symptoms come on strong and it’s after hours or on the weekend, ExpressCARE is here for you and the whole family – without an appointment, 365 days a year. To make it even more convenient, most sites offer onsite X-ray services and an online estimated wait time (find wait times at LVHN.org/expresscare), so you can select a location with a shorter wait. You also can visit an ExpressCARE location to get a flu shot – it’s still peak flu season. For serious issues, such as a broken bone, chest pain, deep cut, head injury, coughing up blood, loss of consciousness, severe stomach pain, suicidal feelings, severe shortness of breath or signs of stroke (numbness, slurred speech and vision changes), call 911. 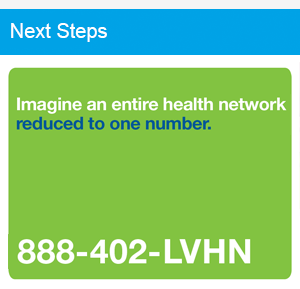 ExpressCARE is part of Lehigh Valley Health Network. So when your ExpressCARE visit is complete, your LVHN electronic medical record is updated. You can see your ExpressCARE visit summary on your own MyLVHN account, and your LVPG primary care physician will see a record of your ExpressCARE visit and know about any treatment you received or if you need follow-up care.